Refresh and hydrate your skin, leaving you feeling like new! Parched skin is the result of low levels of sebum and is frequently prone to sensitivity, resulting in a taut, uncomfortable feeling after washing. Sometimes it can feel like the only relief comes from moisturizer or skin cream. Dry skin comes in varying degrees of severity, with the very worst cases exhibiting chapping and cracking. These conditions are only worsened by heavy wind, extreme temperatures, and even air conditioning. But don’t worry — trust Ottawa’s Dermis Advanced Skin Care to treat these skin conditions and clear them up today! 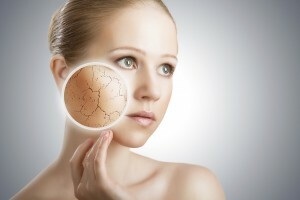 Dryness is exacerbated by wind, extreme temperatures, and even air conditioning, all of which can cause the skin to flake, chap, and feel tight. This type of skin is tightly drawn over bones and looks dull, especially on the cheeks and around the eyes. You may notice tiny expression lines on these spots and at the corners of the mouth. Using only marine and botanical ingredients, this GM Collin® treatment targets fine lines and wrinkles, promoting the synthesis of collagen and replicating elastin to renew elasticity and suppleness in your skin. This treatment cannot be used by individuals with severely inflamed, dehydrated, or couperose skin. In another GM Collin® professional treatment, pure lyophilized native collagen and other biotech-derived extracts are used to offer intense hydration. Line and wrinkle reduction is clinically proven, as are increased cell metabolism, improved cell regeneration, and the tightening of dilated pores following extraction.